The drupe fruits of the bird cherry are like "mini plums“. The flesh is tart, with a high C vitamin content, astringent in the mouth, but some like this taste. They have an anti-diarrheic effect. For tea the leaves as well as fruits are used. Try a spoonful of berries in a glass of water, taste and decide if you should pick and dry some more. The bird cherry is a common shrub everywhere and sometimes grows into a big tree; as young it tolerates a shady growing place. 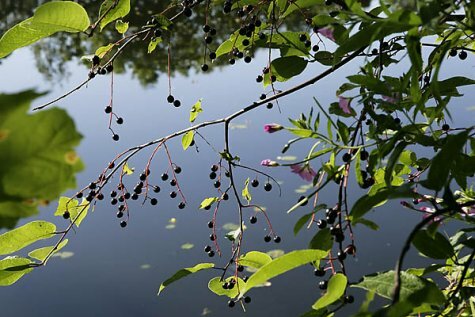 Bird cherry is not recommended for planting in your yard, but there is no really good reason for it. Probably insect pests are feared, but the bark and shoots of the bird cherry are not eaten by rabbits nor even by the unfussy goat, and while we observed wide-spread damage in 2005-06 from the bird cherry ermine moth (Yponomeuta evonymellus), with great numbers of bird cherries without leaves, there was no harm to neighbouring trees and the bird cherries recovered the next year.